Well prepared contemporary cuisine and a gracious setting befit Meridian’s tony Northside address. 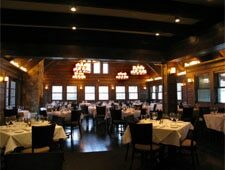 : Gracious dining is in store at Meridian, situated amidst mansions along Indianapolis' tony North Meridian Street. Take a seat at the bar for an appetizer or snack before seeing a play, or enjoy a leisurely meal in the well-appointed dining room. Smoked corn purée is a signature starter, as is roasted beets with goat cheese, pistachios and apple cider gastrique. The lamb duo of grilled leg and braised ribs pairs beautifully with collard greens and Prairie Farms grits. We also recommend the wild boar bolognese with house-made pappardelle and lemon ricotta crostini, and the duck breast and duck tamale with mole. Skip the dessert of milk and cookies or miniature donuts served in a brown paper bag, and ask for more of the satisfying warm rolls while finishing a hand-crafted martini or aged scotch.